Nothing says springtime to me more than salmon with fresh vegetables. It’s been a favorite of mine for as long as I can remember. While I enjoy grilling my salmon and veggies on the BBQ pit I don’t always feel like going outdoors to grill, even though it’s probably the easiest way to cook without the mess of cleaning up. So when I’m looking for something different to whip up I always tend to think of stir-fries. The key to a great stir-fry is getting all the ingredients cut up and prepped along with the seasonings needed. This is called mise en place. Mise en place is key to any stir-fry and insures that your dish has all the ingredients ready before preparing your meal. Plus it makes your dish come together quickly and without a hitch. 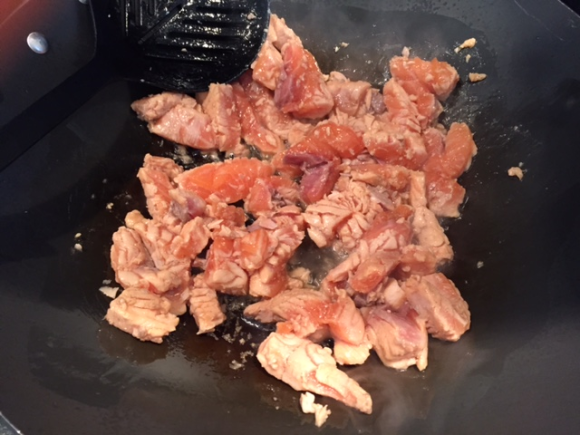 A favorite stir-fry of mine is this Salmon Stir-Fry. I use to put it over pasta but since we prefer to limit our carbs I bring out my Spiralizer and create some zucchini pasta to mix with it. The flavor combination is wonderful and what I love most is that I’m not stuffed after eating a plate. 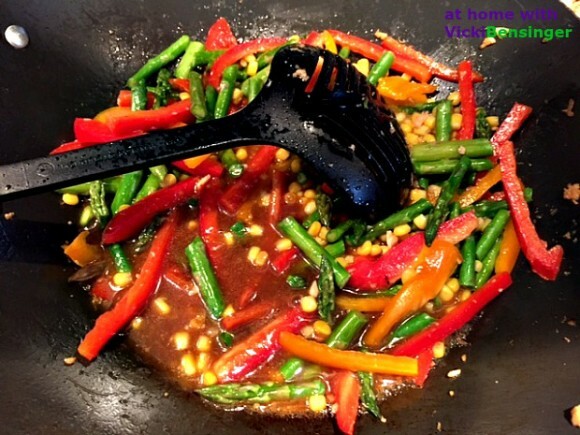 This dish has everything you want in a meal – protein, a rainbow of colors from all the veggies providing you with vitamins, and minerals, plus it’s packed with flavor from the seasonings. Don’t let the ingredient list shy you away from creating this dish – it’s really quite simple. In fact, if you prefer, mise en place all ingredients from the list above ahead of time. 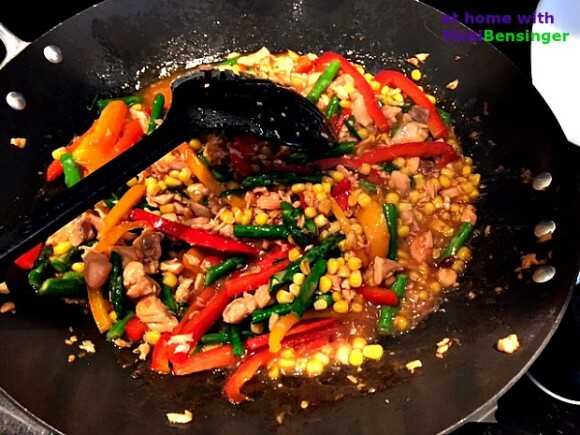 Place in refrigerator, until you’re ready to stir it up in the wok. Once the woks on the stove, your dish will be ready to serve within 5-7 minutes. I hope you’ll try this. If you don’t have a Spiralizer then you can use a carrot peeler on the zucchini. Cut salmon in half lengthwise. Cut across the salmon, making 1/4 inch wide pieces. In a small bowl, combine the soy sauce, rice wine, and 2 tsp. canola oil. Mix thoroughly with the salmon. Marinate the salmon at least 15 minutes but not longer than 8 hours, refrigerated. Cut the kernel off the corn or use frozen corn. Cut the asparagus in 1 inch lengths on a diagonal. Seed and stem the red pepper, then cut into matchstick size pieces. 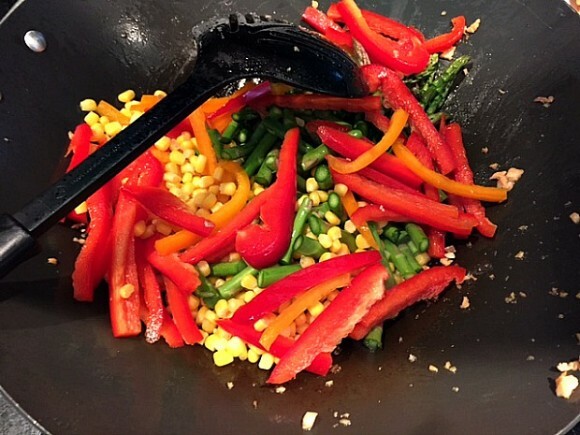 Combine the corn, asparagus, and pepper and set aside. Cut the chives into 1 inch lengths. Place the almonds on a cookie sheet and toast for 15 minutes; then set aside. In a small bowl, combine the seasonings; set aside. In another small bowl, combine the sauce ingredients and set aside. Prepare the Wok: Place a wok over the highest heat. When the wok becomes very hot, add half the cooking oil to the center. Roll the oil around the wok and when the oil gives off just a wisp of smoke, add the salmon. Stir and toss the salmon until it loses its raw exterior color, about 2 minutes, and then slide the salmon onto a plate. Immediately return the wok to the highest heat. Add the remaining cooking oil and the seasonings. Stir fry the seasonings, and as soon as they turn white, about 5 seconds, add the vegetables. Stir and toss the vegetables until the pepper brightens in color, about 2 minutes. Stir the sauce, and then pour it into the wok. Return the salmon to the wok and add the zucchini pasta and almonds. Stir and toss until all the ingredients are glazed with the sauce, about 1 minutes. Stir in the chives. Taste and adjust the seasonings. Immediately transfer to a platter or dinner plates and serve. 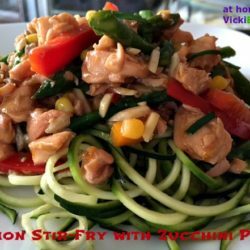 Alternative: Place zucchini onto plates, then top with hot salmon vegetable stir-fry. Looks delish! I really want to try to spirilize the zucchini. Yum! Myra you should get a Spiralizer, they’re so much fun to use and create healthy dishes too! Low carb, good fat and protein…and not to mention it’s DELICIOUS! I agree Angie. I hope you’ll try this recipe. I’m a real fan of stir-fry, too. Quickest way to put together a meal that I know! This so good — thanks for this. You’re welcome John. I hope you enjoy this dish if you make it. Looks perfect to me, Vicki! I’d make zoodles for me and regular pasta for Bill and we’d both be thrilled with our dinner. It tastes great either way. I keep telling myself I am not going to buy a spiralizer and then I see another great recipe like this and I get tempted once again. This sounds delicious! I love mine and have purchased 3 more to give as gifts. I hope you enjoy this dish if you decide to make it. The spiralizer is so much fun to create dishes with, you should definitely get one. This looks delicious. I’ve often wondered if I can buy one of those machines that turn vegetables into pasta strings here in Malaysia? If you can’t you can always use a vegetable peeler. However if you get Amazon there then I’ll be you can order one. Oh Vicki…how creative you are!! I have to get me one of those spiralizers. Fabulous recipe with lots of flavors and look at all those textures. Bobby and I would both love this! Thanks for sharing! This dish is full of flavor, I’m sure you’d love it. Definitely get a spiralizer, they’re fun to play with and healthy things come out of them. Love the gorgeous colors and flavors of this dish. So healthy and delicious! I hope you’ll try this. I’m just in mood to prepare a great pasta and found a perfect proposal at your post. Thanks for the inspiration, Vicki. Yes this is perfect and without the added carbs. I’m going to have to dig out the spiralizer for this one. Outstanding dish. A spiralizer is great for so many dishes. Let me know how you like it if you purchase on and make my dish. Sounds like a light and perfect spring/summer meal. 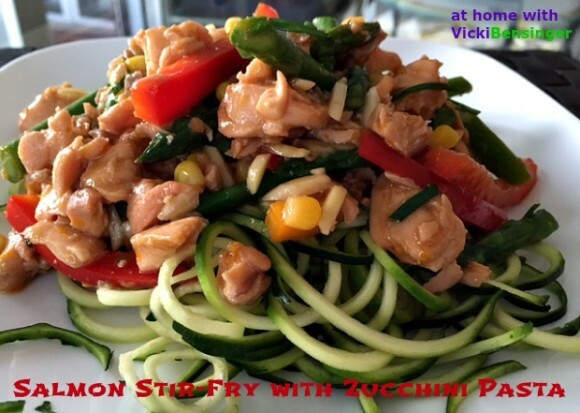 I’ve never done salmon in a stir fry, great idea! I love sitr-fry anything. Plus it’s quick and healthy. Salmon is wonderful prepared this way, I hope you’ll give it a try. This is a fantastic salad.I love stir fries and with the zoodles it’s amazing looking. My family loves salmon. Thanks for a great idea.